Are you a blogger? 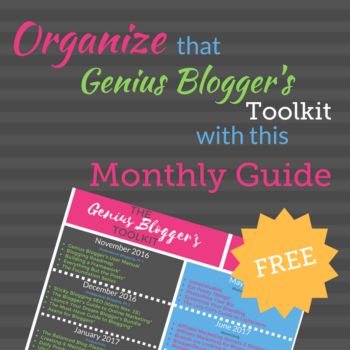 Did you get the Genius Blogger’s Toolkit last week when it was on sale? If you did, then you are now probably in the same boat I’ve been in —overwhelmed! It was a steal of a deal–over 60 products by well-known and successful bloggers for less than $100. And, it was probably one of the largest professional development resources I’ve ever spent money on. That said, knowing I wanted to get the most of my investment, I decided to try to organize the material into a manageable 12-month schedule. A few of the products, especially the e-courses, expire within 12-months. Blogging and social information changes quickly. I want to make the most of the information while it is current. 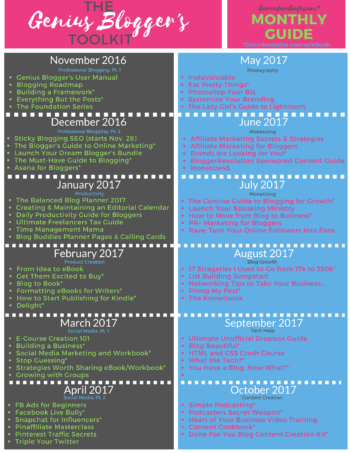 I didn’t want to miss out on any of the live events included, like the Sticky Blogging SEO course (which begins November 28th). To make the impossible (digesting this huge pile of resources), possible, and 12-months seemed about the right amount of time to do that. Why These Topics These Months? I plan on focusing primarily on developing a professional front. I don’t know about you, but I want all those new people who will be coming to my site to see a professional blogger right from the beginning. 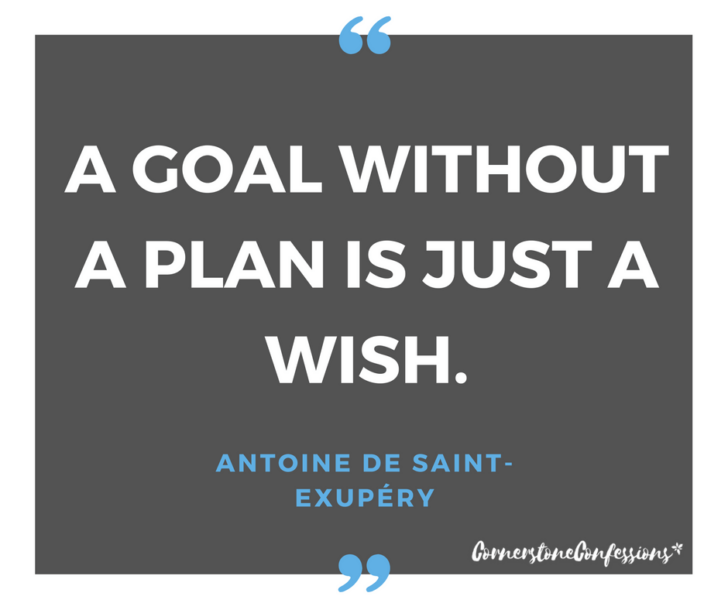 Since January is all about goals and productivity anyway, it seemed like the perfect time to incorporate this into the blog as well. This month I’ll be focusing on product creation. Why? Because May is one of the best months to release new products. Learning and creating during February should give me plenty of time to have a successful product release a few months down the road. 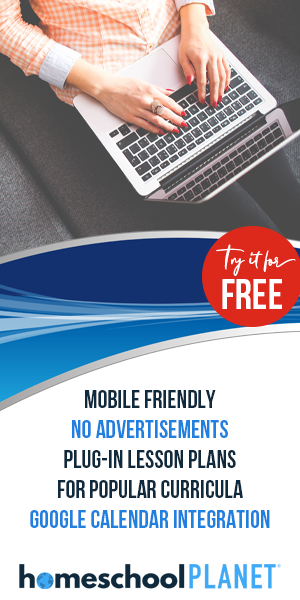 These months are dedicated to social media marketing to prepare for that product release AND to prepare for national social media month which also just happens to be in May. Summer is near with lots of opportunities to practice new photography skills on vacation or learn something new like Photoshop. This way I’ll be ready. With school starting back in August, these months provide great opportunities to share affiliate products and write reviews on products that may come in handy during the school days. August presents a prime opportunity for growth. Blog pageviews are usually up during August as kids return to school and a firm foundation has been set with the previous months’ training to allow for a solid explosion. September is usually a busy month for our family so this month is a bit lighter in content. Most of the topics presented are basic…things I probably already know since I’ve been blogging for awhile. However, I do plan to skim the material to glean any nugget I may have missed in the beginning. 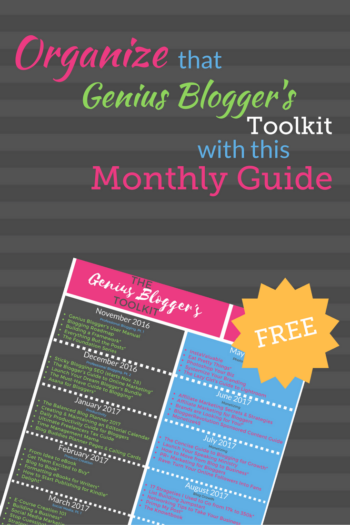 That said, if you are new to blogging you may want to insert this month’s eBooks and eCourses BEFORE November’s just so you get started on the right track. Hopefully, by October I’ll be ready to expand my doors to other creation ideas like videography, podcasting, and the like. This will be a good foundation for this expansion. Ready to get started on your toolkit transformation? Feel free to download this free schedule for a guide. Feel like you are still going to struggle to get it all in? Let me just relieve you of that pressure–you probably won’t. That said, pick and choose the products or courses that seem most interesting to you that month, and go for it. To help with this process, products with asterisks on the guide indicate a downloadable product that probably doesn’t have an expiration date. Go ahead and download those products, but then consider focusing first on the products WITHOUT the asterisks since you will have more time to read/listen to that other content after the 12 months are up. Have fun learning and growing! What toolkit products are you most excited about? Sweet. I’ve already started on some of them, and enjoying it. Me too! It really was a good deal. What’s been your favorite find so far? Thanks Kathy! I bought the kit since I knew it was a great deal, even though I only have three posts to my name! 🙂 Looking forward to working through these. I bought the toolkit specifically for Lena’s “17 Strategies” book and Abby’s “Framework” book since I knew I wanted those for sure. I’ve already read through Abby’s book and feel like I could spend the entire 12 months implementing just that! Can’t wait to identify more resources that will be helpful. I’m most of the way through the Asana course, which has been interesting. A lot hasn’t been relevant to me since I don’t have a team, but a lot has been. The Rave class has been really fun to watch. Kind of different. Of the ebooks, I’ve skimmed a few, a lot of them have been very similar in what I’ve looked at so far. I’m working on Abby’s book right now! Cool! We’ll have to compare notes. Have fun reading and learning! Same here. Rave–good to hear. I will have to make sure to make that a priority. How many years have you been blogging now Ticia? I was thinking we started about the same time. This is pretty amazing. Thank you!! I started Ruth’s productivity course and I’m loving it! This is great! It’s such and awesome resource but a bit overwhelming, I love how you’ve broken it down!! Thank you! You bet! I know what you mean. Hope it helps!